For those that don’t check the blog, a bug fix was issued for the AI vans mod a couple of days ago to fix the Belgium skins spawning everywhere all the time. First up, you may have noticed a lack of trailer related updates lately. This is due to the fact I have been given some information relating to beta builds of the game. It has been suggested that there maybe another change in the handling of cargo files in relation to the DLC. I am hoping the person who told me this is working on outdated info and they are actually meaning the cargo change that happened in the 1.14 update. But if there is indeed another change to cargo coming that would require all standalone trailers and cargo mods to be updated, it is going to mean a lot of work on my part to get them updated again. So as you might imagine, I am not going to be releasing any new Combo packs or new trailer with cargo releases until after the DLC launches. A little news on the DLC date. We always say that the dates on websites should be ignored until SCS officially reveal one. This is because, unlike large companies, SCS do not work to a deadline. They work on their games/add-ons until they are finished and only give a date when they are ready. As many of you may have realised, the date of release has changed to April 24th. The difference this time is that every big store (and the publisher) is giving the SAME DATE. This is the first time this year that the date has been consistent over all stores. This could suggest that SCS is confident they can meet this date (that or it’s a huge coincidence they all picked the same date.) Now, regardless of whether this date is correct or further delays take place. SCS will not confirm a release date until they have sent out the hard copies to their publisher for them to make the disc versions. This means even if the date is 100% accurate, they won’t tell us until around April 20th. While it is just speculation on my part, it is very likely at this point to be close to accurate. The DLC has been in beta testing for release for just over a month, so the only thing delaying release at this point will be bugs. So the real question is; How many more bug will be found and how fast can they be fixed? So for what will likely be the last trailer release of any kind before the SDLC comes, the BSM receives a new trailer and model replacement. The first change is the all green Biomass trailer. Because there is nothing on the side, I saw no reason not to use the Bodex model from TZ Rommi. The reason I won’t use the model for the old biomass and new energy livery has been covered before (and a poll taken to see what you guys would prefer). I will not be changing those unless someone releases a good 110 STAS moving floor trailer (used by Stobart and Malcolm). 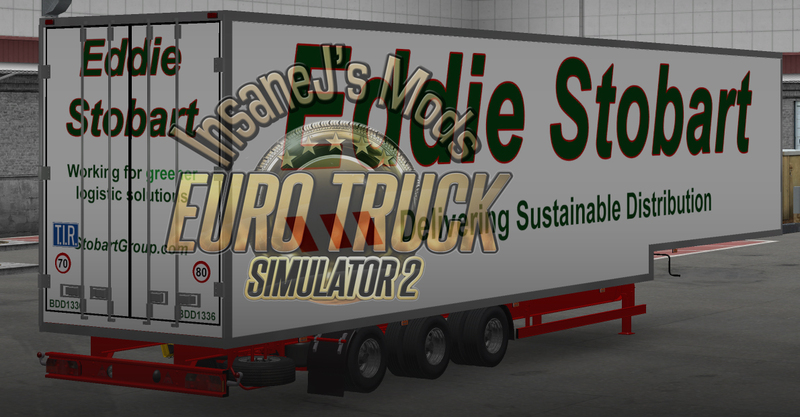 The next update is the double deck box trailer by satan19990 – no cargo is added for this trailer. It simply shares the cargo for the tesco jumbo.